Leg length discrepancy or anisomelia, is defined as a condition in which the paired lower extremity limbs have a noticeably unequal length. Functional (FLLD) or apparent: Unilateral asymmetry of the lower extremity without any concomitant shortening of the osseous components of the lower limb. It can be found in approximately 70% of the population. However, little agreement exists regarding the degree of LLD that is clinically significant to treat, with values ranging from 3 to 60 mm. Some authors have tried to determine a significant LDD by quantification, others by a significant discrepancy in functional outcomes. Prevalence rates for leg length difference often lack crucial information regarding demographics, examiner experience, methods to recruit patients, methods used to detect leg inequality and yet it is often cited and used by other authors. Check for specific compensation used by the patient to level out the difference in height. Increased muscle activity in several muscle groups. Biomechanics in running is different from walking, as are the effect of LLD. In running, the vertical oscillation is greater and there is no double support so weight is not shared between legs. The stance phase is only 30% in running whereas 60% in walking. This results in stress on the lower extremity that is three times that of walking. Evidence is conflicting about the effect of running but it is suggested that the effect is also augmented threefold. The current literature is very ambiguous. LLD appears to affect the lumbar spine, at least in part, by creating a lumbar scoliosis. It has been shown that LLD leads to pelvic obliquity on the frontal plane inducing a scoliosis. Lumbosacral facet joint angles appear to be smaller on the short side, it is hypothesized that asymmetry of joint angles predispose patients to osteo-arthritic changes in the lumbosacral joints. Further research will conclude if LLD is merely associated or a objective causal factor in low back pain (LBP), The literature at hand is contradicting and non conclusive. A longer leg might be a predisposing factor in Osteoarthritis (OA). With length increasing, femoral head contact/ weight bearing area is decreasing. (+10mm- 5%/ +50mm - 25,1%). Combined with an increased tone in hip abductors caused by elongated distance between origin and insertion and an increased GRF puts the longer leg at risk. Greater incidence of stress fractures in the tibia, metatarsals and femur of the longer leg appears consistent with the greater forces emitted trough the longer leg described under hip pain. There seems to be an association with trochanteric bursitis, patellar apicitis, patellar joint incongruences and myofacial pain syndrome of the peroneus longus. There are three types of limb length discrepancy inequality (LLDI) also called leg length discrepancy. 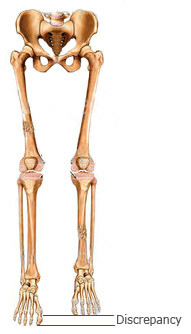 Anatomical; structural limb length inequality. It’s a physical (osseous) shortening of one lower limb between the trochanter femoral major and the ankle mortise. Functional; non-structural shortening. It is a unilateral asymmetry of the lower extremity without any shortening of the osseous components of the lower limb. * A functional inequality may occur at any level of the lower extremity from the most superior aspect of the ilium to the most inferior aspect of the foot. Different causes may lead to a functional inequality: foot mechanics, adaptive shortening of soft tissues, joint contractures, ligamentous laxity and axial mal-alignments. Environmental; it’s only significant for a small number of high-level athletes or a specialised workforce population. An example: accumulation of forces during running when a runner consistently trains on one side of a crowned road. Environmental LLI can easily be solved by asking the runner to run in the opposite side then he usually runs. Environmental LLI is often considered as a functional LLI. The most accurate method to identify leg (limb) length inequality (discrepancy) is through radiography. It’s also the best way to differentiate an anatomical from a functional limb length inequality. A single exposure of the standing subject, imaging the entire lower extremity. Limitations are an inherent inaccuracy in patients with hip or knee flexion contracture and the technique is subject to a magnification error. Computed Tomography (CT-scan)1: It has no greater accuracy compared to the standard radiography. The increased cost for CT-scan may not be justified, unless a contracture of the knee or hip has been identified or radiation exposure must be minimized. However, radiography has to be performed by a specialist, takes more time and is costly. It should only be used when accuracy is critical. Therefore two general clinical methods were developed for assessing LLI. Involves measuring limb length with a tape measure between 2 defined points, in stand. Two common points are the anterior iliac spine and the medial malleolus or the anterior inferior iliac spine and lateral malleolus. Palpation of bony landmarks, most commonly the iliac crests or anterior iliac spines, in stand. These methods consist oof detecting if bony landmarks are at (horizontal) level or if limb length inequality is present. Palpation and visual estimation of the iliac crest (or ASIS) in combination with the use of blocks or book pages of known thickness under the shorter limb to adjust the level of the iliac crests (or ASIS) appears to be the best (most accurate and precise) clinical method to asses limb inequality. You should keep in mind that asymmetric pelvic rotations in planes other than the frontal plane may be associated with limb length inequality. A review of the literature suggest, therefore, that the greater trochanter major and as many pelvic landmarks should be palpated and compared (left trochanter with right trochanter) when the block correction method is used. Patient is standing with feet 10 cm apart, knees extended and equal weight on both feet. The clinician places his/her hands on a bilateral anatomical structure: spina iliaca posterior superior, spina iliaca anterior superior or crista iliaca left and right. Now the clinician visually assesses if there is a length inequality, and if so, places a wooden board of 0,5 cm under the foot of the shorter side. Keep placing thicker planks under the shorter side until equal length is reached, the thickness of the plank is equal to the leg length difference. Although reliability is highly dependent on the accurate measurements of the clinician, this method has shown excellent results in inter-examination results between highly trained clinicians and medicine students. Confounding variables reported by literature are: pelvical asymmetry, incorrect positioning of feet, obesity, joint contractures, scoliosis and inaccurate measurement. Most commonly, patients with pain from the resultant imbalance in muscle force around the hip and knee, as well as around the spine. Pain and fatigue from the longer leg’s Quadriceps and hamstring muscles (flexed knee syndrome). 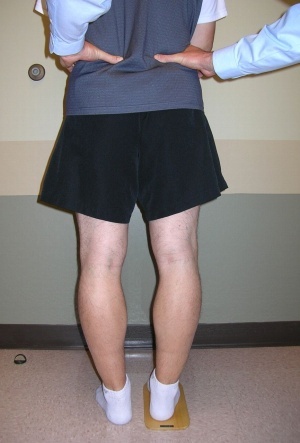 Patients flex their knee during gait to maintain level pelvis. Instability or dislocation as result of component orientation, the pain is often a result of hip and periarticular muscle fatigue from preventing subluxations. Correctable cause after THA - initial postoperative apparent LLD.The initial postoperative LLD can be described as periarticular muscle spasm, lumbosacral scoliosis, and pelvic obliquity. They can each produce this early postoperative LLD. The physical result is a tilted pelvis relative to the floor, with the surgical hemipelvis pushed inferiorly and the contralateral hemipelvis pulled superiorly, giving an apparent LLD despite equal lengths from the anterior superior iliac spines to medial malleoli. The mainstay of treatment for this problem is patient education, reassurance, physical therapy muscle techniques, and possibly a temporary shoe lift. The patient should be reassured that most cases resolve within 6 months from surgery. Use of shoe lifts, up to 20mm. Further corrections should be done on the sole of the shoe or making adapted shoes for the patient. Consist in stopping the bone growth (in the longest leg) in adolescents and children. Sometimes, in patients with skeletal maturity, limb shortening by bone resection procedures is sometimes performed. Limb lengthening is generally reserved for LLI greater than 40-50mm. It involves corical osteotomy followed by the extremity being fitted with an external fixation device that applies continuous longitudinal distraction across the osteotomy site. The non-surgical intervention is mainly used for the functional and environmental types of leg length discrepancies. It is also applied to the mild category of limb length inequality. Non-surgical intervention consists of stretching the muscles of the lower extremity. This is individually different, whereby the Tensor Fascia Latae, the adductors, the hamstring muscles, piriformis and Iliopsoas are stretched. In this non-surgical intervention belongs also the use of shoe lifts. These shoe lifts consists of either a shoe insert (up to 10-20mm of correction), or building up the sole of the shoe on the shorter leg (up to 30-60mm of correction). This lift therapy should be implemented gradually in small increments. Several studies have examined the treatment of low back pain patients with LLD with shoe lifts. Gofton obtained good results: the patients experienced major or complete pain relief that lasted upon follow-up ranging from 3 to 11 years. Helliwell also observed patients whereby 44% experienced complete pain relief, and 45% had moderate or substantial pain relief. Friberg found that 157 (of 211) patients with LBP, treated with shoe lifts, were symprom free after a mean follow-up of 18 months. However, evidence in the literature reggarding the use of lift therapy is inconsistent. Shoe lifts can reduce low back pain, if patients’ low back pain is correlated to the LLD. See Differential Diagnosis! Important is to gradually increase the corrective lift, rather than correct a fixed percentage of LLD . Shoe inserts appear to reduce (chronic) low back pain and functional disability in patients with LLDs of 10mm or less. It can be added to the treatment (low back exercises) . The importance of exercises lies in the fact that (one study suggest that:) the quadratus lumborus endurance ipsilateral to the supine short leg has significantly decreased endurance compared to people with no leg-length asymmetry . However, this is only 1 small observational study and further research about changes in muscle endurance and strength in people with LLD is needed. 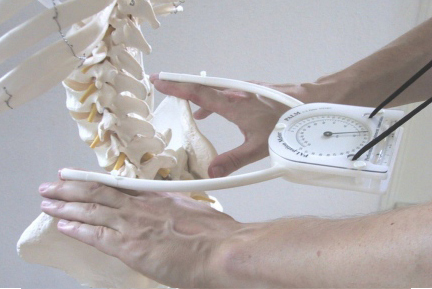 The PALM is a reliable and valid instrument for measuring pelvic height difference (PD). It is convenient, cost-effective and is a good alternative to radiographic measurement! 2 tape strips were placed on the ground, 15cm apart. The tape strips mark the location on the floor were patients have to place their feet. The patients are asked to walk for 10 steps and the align the medial borders of their feet with outside of the tape strips. Patients have to stand fully erected (no knee or hip or spine bending). The PALM is placed on the most superior aspect of the iliac crest. The distance between caliper heads are measured to the nearest mm and the angle of inclination to the nearest half degree. The inclinometer ball is designed to move towards the side of the shorter limb.